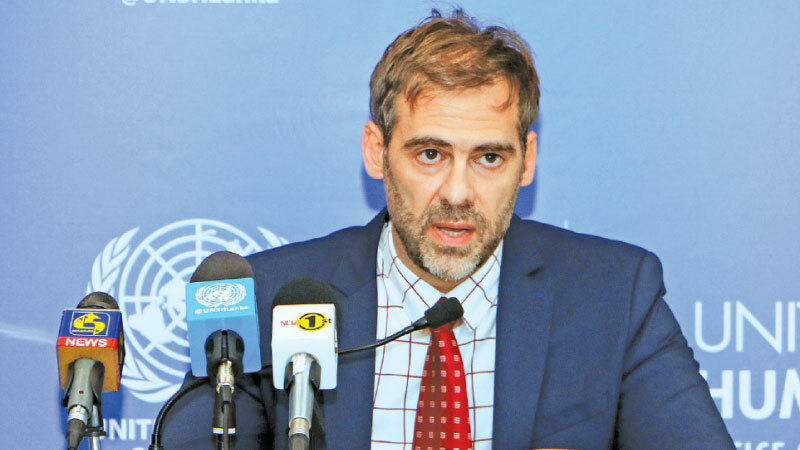 The UN independent expert on foreign debt and human rights, Juan Pablo Bohoslavsky yesterday said that microfinance lenders are targeting women in areas that are below the poverty line and affected by war and these institutions charge upto 220 per cent interest rates for their loans as compound interest. Bohoslavsky added that some cases have been reported to him where women have been pressured by debt collectors to exchange ‘sexual favours’ for outstanding instalments. “I have also learned of cases of borrowers who have tried to sell their kidneys for money to repay loans”, Bohoslavsky added. He was speaking at a press conference held at the end of his nine day official tour of Sri Lanka yesterday. Bohoslavsky noted that human rights should be at the center of all efforts to create economic growth that would benefit everyone and have an equitable distribution of wealth. He further said that the Sri Lankan Government should undertake an assessment of the human rights impact of both its economic reform policies and infrastructure projects. All international lenders and donors I met in Colombo expressed concerns for the environment and human rights implications of the projects they finance. However, ,none of them have in place a human rights impact assessment framework. Some mentioned “social” and “gender” impact evaluations conducted before taking the final decision on the project, but the legal standards against which the projects are assessed were not clear and the result of these evaluations are not publicly available. Therefore, I advise international finical partners to establish more robust frame works to assess the human rights implications of the projects, covering both substantive and procedural rights. The strategy chosen by the Government, as recommended by the International Monetary Fund (IMF), was to stabilize the economy by strengthening the fiscal and external sectors via international borrowing. It also included developing mega infrastructure projects, many of them launched during previous administrations,” Bohoslavsky said. Servicing this debt is now the country’s most important expenditure, and a significant amount of borrowing is being allocated for this purpose,” he added. “However, social spending should not be cut in order to repay growing debts if less harmful policy options are available. There are other options to consider. These include boosting domestic demand through progressive tax reforms, expanding social benefits, increasing minimum wages and renegotiating the debt with creditors in order to generate revenues to ensure that no one is left behind,” Bohoslavsky stressed. This government has advanced strict measures to reduce fiscal deficit, aiming to reach the 3.5 percent target by 20202. Significant efforts have been deployed by the government to maintain macroeconomic stability and a range of reforms were adopted to serve that goal. Besides fiscal consolidation measures, there were also reforms on its social safety net programmes. Sri Lanka’s vision 2025 programe implemented by present government lays out a series of announced measures for 2025 including deregulatory reforms impacting on land and the labour market. I also welcome the announced raise in expenditure on education and health in 2018 . Yet, it was brought to my attention that social spending has not always matched budget estimations in the past. Government has expressed its intention of engaging in public private partnerships in important social sectors such as health, education, etc. These efforts of public private partnerships should not replace the Government’s primary obligation of ensuring the economic, social and cultural rights equally among everyone and its obligation in allocating maximum available resources. There is a consensus that a greater mobilisation of resources is needed. It has been estimated that the majority of all illicit financial flows in the world are related to cross-border tax-related transactions. However, because tax evasion is not considered a predicate offence in the country, banks do not have a duty to report suspicious transactions of their clients in relation to tax evasion. I urge the Government to close this legal gap,” the expert said. The government has taken measures to broaden its tax base. Yet, high fiscal deficit remains and public finances are affected by limited reserves. I would like to highlight the adoption of the Inland Revenue Act in 2017, which contributes to simplify tax collection and expand the tax base. Similarly, I recognize efforts deployed by the Government to tackle existent discretion regarding tax exemptions. However, it is my view that further steps need to be taken in order to ensure that income and wealth taxes effectively and sufficiently generate public revenues while reducing economic and social inequality in the country. Since the end of the war in 2009, large-scale infrastructure projects including the Colombo Outer Circular Expressway, power plants, the Hambantota Port and Hambantota Airport have been started across the country.